The elder brother of Henry & George. Blackall lived in Caversham Court in Caversham and was very different to his father William Blackall. Just as energetic, but with all the rumbustiousness of a Regency character that got him into an argument at the Gun Street billiard room and only at the last moment was he restrained from fighting a duel. He enjoyed to the full two of the most vigorous activities of the day: politics and fox-hunting. In parliamentary and local elections, long before the secret ballot was introduced, he was accused by his Liberal opponents of making ‘practical appeals to voters’ [in today’s language, that means offering bribes!] but he was never taken to court. Family anecdotes also suggest that he was not over-sensitive when handling members of the public who criticised his business methods. He hunted with Sir John Cope’s hounds, later the Garth & South Berks Hunt that often met at another Simonds family home Newlands. With his groom in attendance, he pursued foxes with ‘ardour’. During these outings, he carried a notebook and it is said, noted down each time he spotted a good location for a future pub within the fifteen mile range of a horse-drawn dray, all in anticipation of the liberalisation of the licensing laws. This foresight allowed him to move when the opportunity finally came, beating his competitors to key locations. Following widespread protests and public inquiries to combat the high price and poor quality of beer, the Duke of Wellington’s administration steered through parliament the Beer House Act in 1830, which authorised the opening of pubs on payment of a local fee of 2 guineas and, significantly, without the need to obtain a magistrate’s licence. At a stroke the older brewers’ monopoly was destroyed and Blackall Simonds showed what could be done with an opportunity to compete on equal terms. Over the succeeding years the number of tied houses was gradually increased but there were also many newly-opened independent beer houses without brewing facilities that were only too glad to purchase his good quality beer. By 1839 the brewery was larger in size than any of its Reading competitors producing 15,000 barrels, well over double the original brewery capacity. It by now had thirty-seven tied houses, twelve in Reading itself. So Blackall Simonds merited his reputation for business acumen, energy and foresight. By building up his local trade, he also prevented the larger London breweries from gaining a foothold in ‘his’ Berkshire area. Those breweries had for a long time complained bitterly about being unable to sell their porter in the counties but he showed conclusively that locally brewed beer could fully satisfy local needs. In 1834 he began to brew a novel kind of beer, pale ale, for export; it travelled well, even on the six-months’ journey under sail to the remote colony of Victoria in Australia, although the 1st shipment a few years later was a financial disaster because the importer failed to return the costly ‘hogsheads’ in which it was shipped! Business however developed well and who knows if it was helped by the arrival in 1835 at Port Phillip settlement of Charles Joseph la Trobe (1801–1875) as ‘Superintendent’, becoming the 1st Governor of Victoria in 1851. Huguenots like the Simonds family, his granddaughter Victoria would later marry a brewery Director, Stephen Shea-Simonds (1874-1955). Blackall retired in 1845 and moved with his wife Emma Jane (née Usborne) from the family home at Caversham Court, to Ryde, Isle of Wight, where he built a new home and called it Caversham House. Here we believe that he was one of the first in the family to take up the sport of sailing, at The Royal Victoria Yacht Club, then in Ryde. 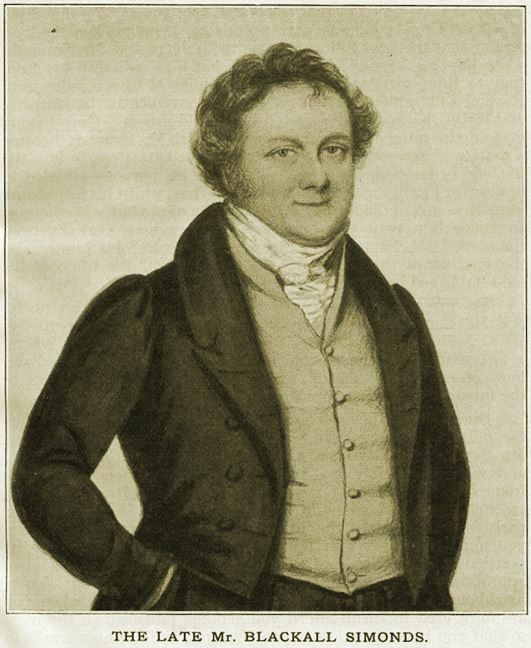 He and Emma had no children, so his younger brothers Henry [1785‑1879] and George [1794-1852] joined the firm in about 1834 and so the brewery became known as H&G Simonds.